Ulster's losing bonus point in their 22-20 Pro12 defeat by Leinster was enough to end Ospreys' hopes of a play-off place this season. The Welsh team had hoped for a big Leinster win, but cannot now finish in the top four play-off spots. Despite Ulster going down to 14 men after 17 minutes at Ravenhill when Tom Court was sent off, the hosts did enough to make the top four. But Ospreys will be Wales' top-ranked team and be in Europe's top flight. 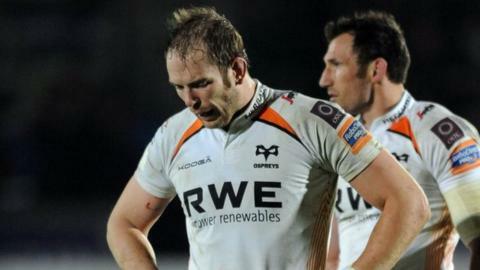 Ospreys did not help their cause when they lost 30-27 at Zebre on Thursday. The Welsh teams' seasons will end in the competition's final round on Saturday, 10 May when all games kick off at 18:30 BST. The Swansea-based region will host Connacht on that occasion.